First off an apology about the tardiness of our blog posting and a quick word about why there has been no blog post for a while. As time wears on, we’re under more and more pressure to get things done each day, as we want to get to Beta testing as soon as we can. This has meant that the blog has taken a back seat and fallen by the wayside. Our aim is to expand the team and create a dedicated role for marketing, social media, and community management, so if all goes to plan you will be seeing more regular blog posts keeping you up-to-date with the game as it develops. This post is going to explain how tactics work in the new game, how game plans are created and what goes into them. A manager creates game plans for his team, which are the blue-prints for how his team is going to play. A manager can create multiple game plans and save them, then for each match they play they will assign one of these game plans to that match, or if unassigned, their current default game plan will be used. A game plan contains a powerful number of tactical options which the manager will have to decide on. These are split into general tactical options and zonal tactical options. General tactical options cover things like how the team sets up for kick-offs or how often they go for drop goals. Zonal tactical options cover things like how you want your team to attack with the ball, the defensive system you want to employ, how strongly you want to commit players to the breakdown and so on. We will go through each in turn, so you can get a good idea about the tactical levers and dials you have at your disposal which will enable you to shape how your team plays in ways that were never possible before. General tactics are tactical options that come into play regardless of where the ball currently is, or cover specific tactical situations. The first of these general tactical options is how you want to kick-off. Do you want to kick deep, or short, or into the middle ground? Do you want to kick towards your forwards (the standard orthodox kick-off), away from them, or down the middle? You need to decide this, but are not stuck with just the one choice. 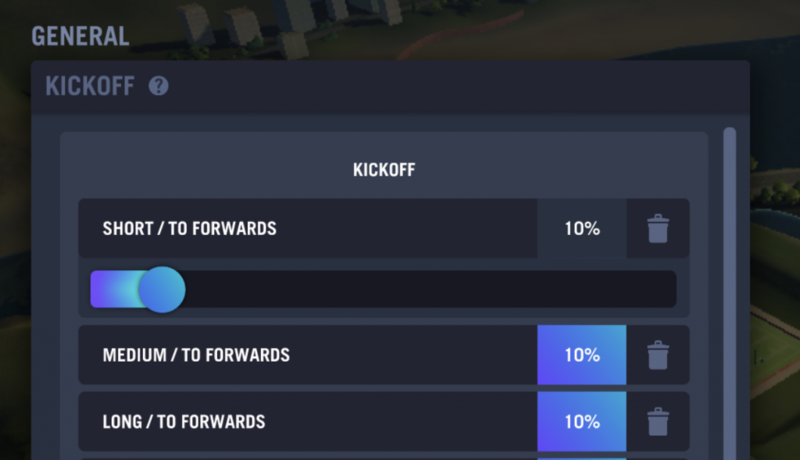 For each type of kick-off you set a %, which will determine the chances your team will take that kind of kick when they kick-off. 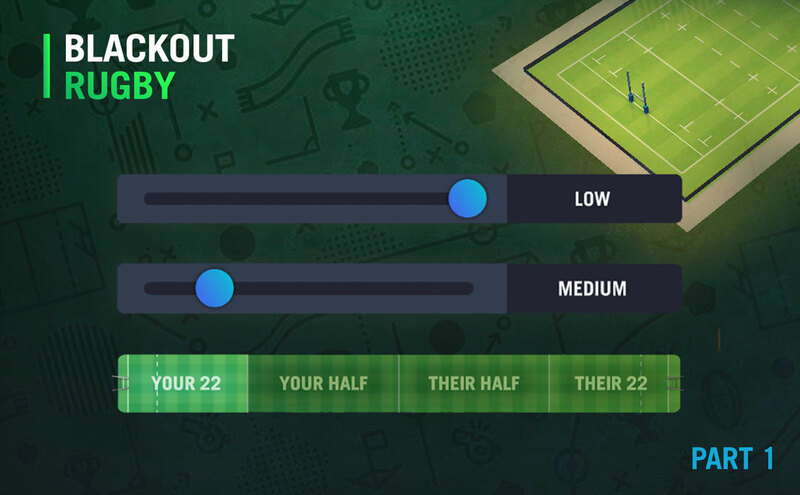 The second of the general tactical options is closely connected – how do you want to set up your team to receive a kick-off. You have two options here – standard or balanced. Standard has the majority of your forwards on one side of the field facing the opposition forwards. Balanced has you spreading your forwards across the width of the field, in order to be more prepared for an unorthodox kick-off. Aside from the kick-off options, you have to decide how often you would like your team to try for drop goals when they are in a position to have a go – this can be set to High, Medium, Low or None, with high being trying to drop a goal frequently and working down from there. The final general tactic option is to do with bonus points. Bonus points affect league games, and are earned by scoring at least three more tries than your opponent in a match or by losing a match by seven points or less. There are three bonus point options you can choose, and you can select all, some or none of them. The first option is ‘Go for try bonus points at all costs’, the second option is ‘If losing, go for a losing bonus point at all costs’, whilst the third option is ‘prevent any opposition bonus points at all costs’. What each of these options does is alter some aspects of your team’s decision making when playing. The actual effects are hidden within the match engine, but most of it is fairly obvious e.g. if you have chosen ‘Go for try bonus points at all costs’ then when faced with a penalty that you could kick at goal in the late stages of the match, you have no chance of taking the kick, and instead will tap and go, or kick for a lineout, or take the scrum, as your team’s main goal is to score tries. Once the tries have been achieved, then your team would go back to normal decision making. So those are the four general tactical options you get to set for each game plan you create. Now we need to move on to zonal tactics, which is where you really get to shape how your team plays on the field. First off, an explanation of what zonal tactics actually means. For purposes of tactics, the rugby pitch is divided up into four zones: within your team’s own 22, from your 22 to the half-way line, into the opposition half up to his 22, and finally the opposition’s 22. For each of these zones you get to set the tactics you will use when the ball is in that zone, hence the name zonal tactics. There are plenty of tactical options that can be tweaked to your desire, so the easiest thing is to go through them one by one and give a brief description of what each one does. This is probably the key tactical option you will set for your team as it determines how your team will attack when it has the ball. An attack pattern is made up of a set of attack plays. You can create as many attack patterns as you like, but you can only use a single attack pattern within each zone. 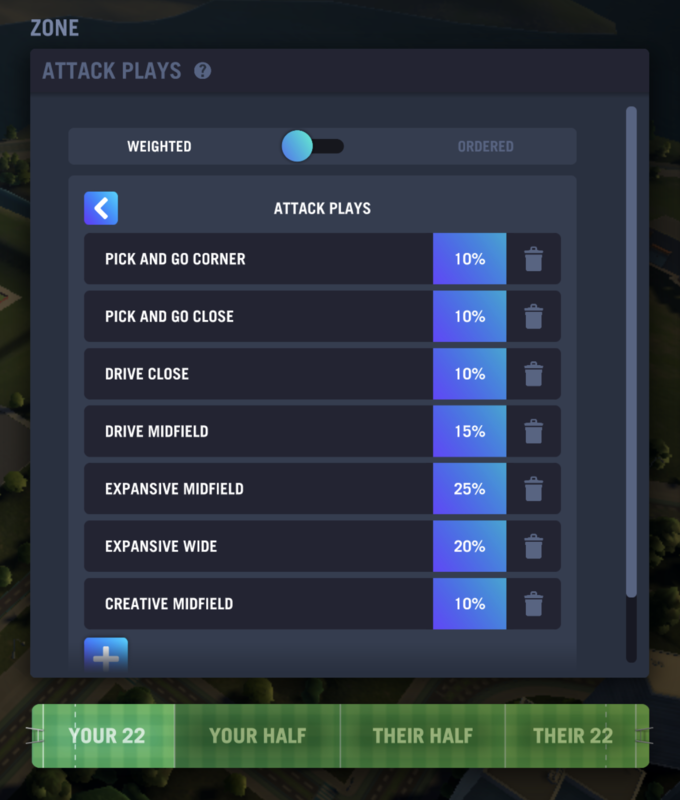 When you start off in the game you will have some attack patterns already created for you, but you are free to design your own and use them instead if you wish. Pick & Go: Primarily the forwards attacking near to the ruck with minimal or no passing at all, especially involving the front five, though can include the scrum-half sniping or the backrow as well. Drive: Again primarily the forwards attacking, but can be a back, especially if the drive attacks further out from the ruck towards the midfield. Usually no more than one or two passes involved before running it up to the line. Expansive: Primarily a passing attack through the hands of the backs, but can involve forwards as well if they are out in the line. Creative: This covers a wide range of different attacks, from complicated moves involving decoy runners and miss passes, to wingers coming off their wing and appearing as an extra man on the other side, to clever little grubber kicks and chips over the defence. These types of attacks are harder to get right, but can be very effective when everything goes to plan. Around the Corner: These attacks target the fringes of the ruck, an area normally defended by the opposition’s front five forwards, primarily the props. Close: These attacks target an area from the fringes of a ruck to roughly where the opposition fly-half stands. This area is normally defended by the forwards spreading out from the fringes of the ruck. Midfield: These attacks target an area from the fly-half to the inside shoulder of the outside center. Normally will be defended by the backs that inhabit those positions, but forwards can turn up here as well, normally a backrow. Wide: These attacks target an area from the outside center to the sideline, and are normally defended by the backs – the outside center and wing. Like a midfield attack, an occasional forward might be out there who has yet to get back into position, or occasionally a backrow forward might be defending wide out. As can be seen from the above, Creative attack plays don’t target specific areas. Instead they seek to target areas where the defence seems weak. When a creative attack occurs the targeted area will normally be determined by one of the half-backs, with their composure and awareness playing a role in their ability to spot a weakness. When a creative attack pays off it can often lead to an improved chance to line-break, but a creative attack that goes wrong can often lead to the attacking side itself coming under pressure. When creating an attack pattern the manager adds these individual attack types into the pattern, and then sets what % of the time each will be used (which is called a weighted attack pattern). Alternatively the user can set the attack pattern to be an ordered attack pattern, where each attack play is done in a specific order set by the manager. So how does all this help the manager to beat his opposition? The key here is to figure out where your team is stronger than the opposition. If you think your front five is better than theirs then attacking around the fringes of the ruck or slightly further out may be a good tactic (i.e. Around the Corner and Close attacks). If you think your pack as a whole is stronger, then think about adding a higher % of Driving plays that attack further out into their midfield, as these primarily utilize your forwards as ball carriers. If you think you have an edge out wide in the backs, then play more Expansive and attack those wide channels and down the sideline. If you think their midfield defence is weak, then play more expansive midfield attacks and driving midfield attacks. If you have a great pair of half-backs who are composed under pressure and have a good awareness, then perhaps upping the % of Creative attacks might be a good idea, especially if you have an excellent line breaking fullback that can enter the line and cut through. There is no right or wrong attack pattern. It is just a matter of finding ones that you think work best for your team. 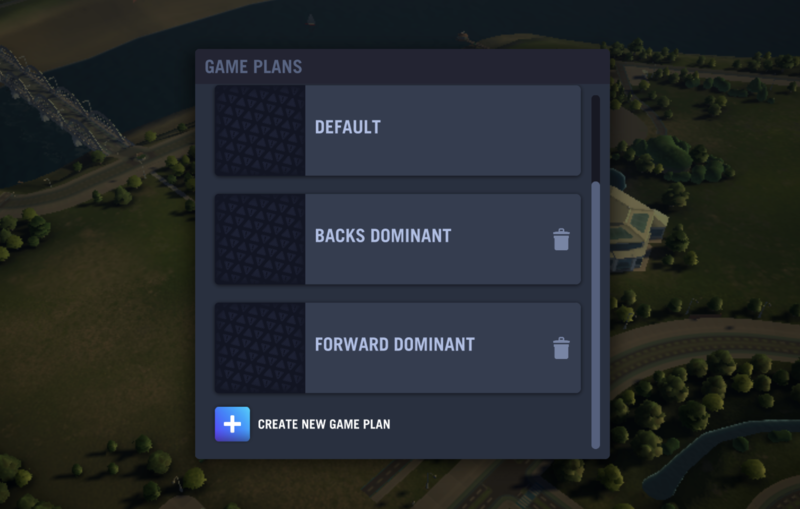 The game will have some default patterns to help you along – at the moment these consist of an attack pattern that primarily uses attack plays built around the forwards, one based upon having a balanced attack pattern between the backs and the forwards, and a third which primarily attacks through the backs. You can use those, tweak them around, or just go out and build your own ones. Part 2 will go into the other zonal tactics, and cover such things such as penalty options, ruck commitment, and lineout options.